Downing, Dorothy Elizabeth. 12th April 2019. Peacefully at hospital, late of Springhill Heights, Bangor. Dearly loved wife of the late Edmond and much loved mother of Neil. Service in Roselawn Crematorium on Thursday 18th April 2019 at 2.00pm. Family flowers only please. 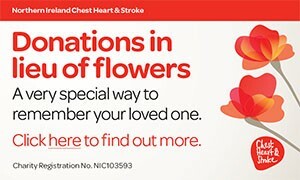 Donations may be sent if desired to Age NI c/o S. Clarke & Son, Funeral Directors, 64 Newtownards Road, Bangor, BT20 4DR. Will be sadly missed and lovingly remembered by her son, daughter-in-law Paula, grandchildren Hannah and Thomas also the entire family circle. I am sorry to tell you that Dorothy Elizabeth DOWNING has passed away.